Once again a great big thank you to all the lovely people who stopped in during our last open studio a few weekends ago. It's all because of you.... with your friendly smiles and encouraging words of support. You are the ones who made our weekend a success. But just In case you were unable to join us and so you don't feel left out.....enjoy this little studio tour. Welcome to the studio! This is the room that I normally paint in but during open studio we set it up like a little gallery. Those are maps on the ceiling. Georgie is Mr. Photogenic when it's picture time. Here he is with Krista Cary, the greeting card artist, who is our ongoing guest artist during open studio weekend. I'm pretty sure Georgie was being bad right before I snapped this photo of Erica. She is trying very hard to get him to sit still and to relax and unwind for a few short minutes. Blenda with Karen owner of Grapevine Gallery at Singer Hill Cafe. A fuzzy photo of Karen Grondin, owner and curator of Grapevine Gallery, Georgie and me. Her gallery is located inside Singer Hill Cafe, a fun place to eat and meet up with friends. 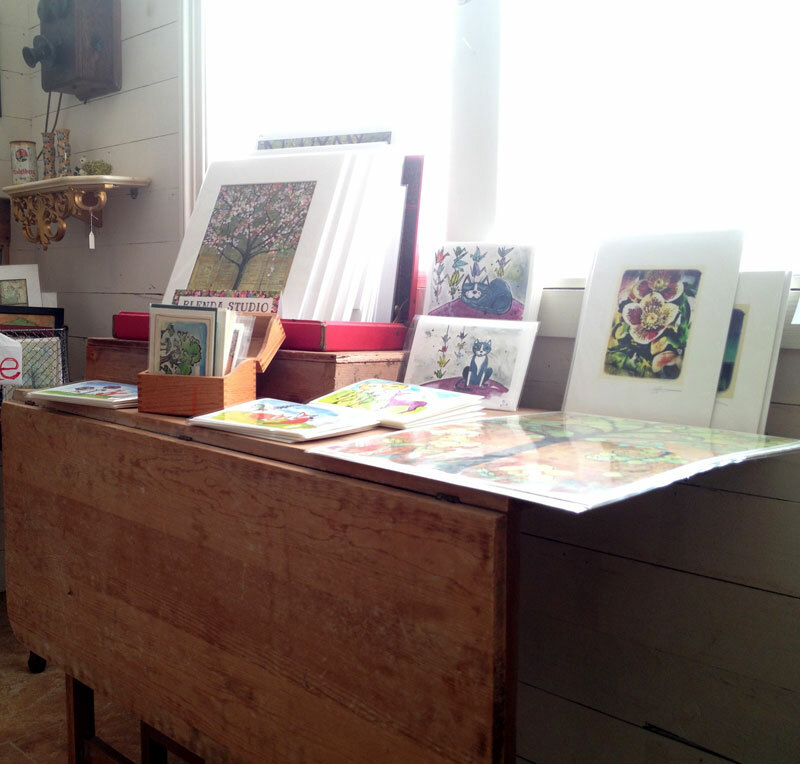 Karen has the cutest display of always new and interesting art from talented local artists. Plus, I'm happy to say, you can find my artwork at her gallery as well. Showcasing prints and greeting cards, such as Erica's tuxedo cat greeting cards and flower prints. Lovely pink peonies from our garden. They smelled so heavenly. I caught Krista Cary working her next whimsical greeting card series. Right above her is one of her paintings. More art and decorative things in the gift shop area of the studio.